Cambridge Analytica, Facebook and GDPR were hot topics this spring and the media-storms surrounding customers’ ability to be in charge of their own data became everyday terms and important issues for consumers worldwide. It culminated on April 11th when Mark Zuckerberg was called into act global computer professor, as he appeared before the US Congress, answering elementary questions voiced by legislators who were in way over their heads, trying to extract information about topics they didn’t fully comprehend. Customer registrations have never been more prevalent than today. Online subscription-models has grown with over 100% per year the last 5 years (*Forbes March 2018), and affiliate marketing businesses are also on a steady rise. 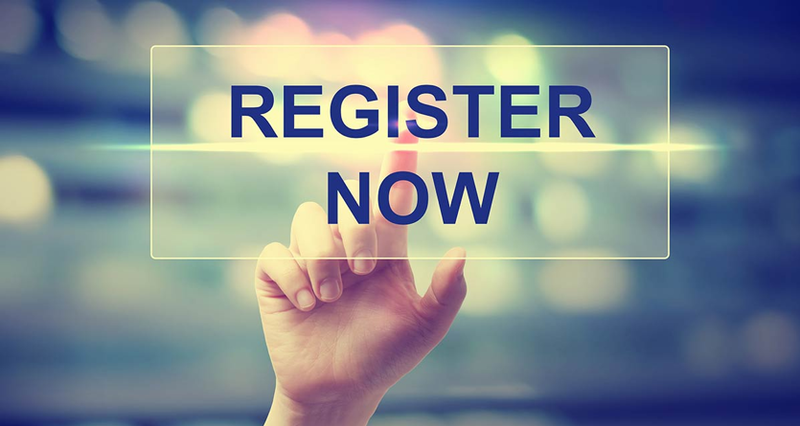 Registrations are used more often than ever, and has become a vital ingredient to succeeding online. There is no sign that this trend should slow down, as 15% of online shoppers have signed up for one or more subscriptions to receive products on a recurring basis, and millions upon millions of customers are of course registered with services such as Airbnb, Uber, Spotify and Netflix. Customer Data Management, and registrations of clients becomes exceedingly relevant in Omnichannel discussions, a term that has been stuck on everyone’s retail-lips lately. There is hardly a management team in the world that has not stated that their company shall improve their Omni-channel brand experience. This goes for industry giants, as well as startups. Amazon will account for over 50% of online sales in the US 2018. The question of how to tackle Omni is no longer something that can wait. It is a legit stress-factor for many businesses today. When companies like Amazon are on track to eclipse more than half of ALL online shopping in the US this year (44% 2017), everyone else has to come up with new ways to stand out. This is a lot easier said than done of course. Amazon differs from most businesses due to their superior efficiency and control of distribution. It will be tough, if not impossible for other retailers to compete with them in this regard. A number of online experts believe that the way to get noticed is to handle the Omni-question creatively, or at least in ways that strengthen your brand. To do that, companies need to get to know their customers better, and deliver unique experiences to go with their product or service. In recent years, e-commerce has focused on handling the check-out as smoothly as possible, i.e. quick and easy payment of orders. A simple check-out meant a good conversion of purchases on the traffic driven to an online-shop. Companies like Paypal, Stripe, Klarna and others have built their entire existence around this, and the developments in the area have been rapid. Today, with a few simple clicks, customers can choose between paying in instalments, getting invoiced, pay with credit card or bank transfer. With this focus on easy check-out, e-commerce has largely been about showing an advertisement with an offer, then executing the purchase and delivering the product, and it is this focus that experts predict will change. As the smooth check-out has become a hygiene, the next race will be smart check-in’s aka signups. To excel in the future, companies will need to personalize experiences for their customers and a good registration enable personalized offers, experiences and distribution, provided that the collected information is processed and utilized in clever ways. A great signup needs good design, smart verifications and handling of input-mistakes, as well as technical solutions involving available data points to make registrations relevant to each customer, with regard to where they live and much more. Progress in this area could be good news for consumers. Online registrations have largely been the same since the time of MySpace and companies have done little to improve the experience. Making signups something consumers enjoy may in a broader perspective lead to more consumers trying more new services, which in turn would help innovations grow faster. If companies also take care of, and use customer information intelligently, we can all look forward to more personalized and thus better services, more fitted to our liking. Omni is, at the end of the day simply a term for giving us better experiences in every point-of-contact, and this of course is what we all seek from our favorite brands. Is clothing-giant H&M conquering the future of retail? "We are more prepared to cope with the new digitized world than I think we have explained to the stock market. I do not see the threat picture being painted - I see great opportunities". The words are from H&M’s main owner Stefan Persson, and was said to Swedish business newspaper Dagens Industri at the end of 2017. With 4500+ stores, 170-thousand employees and roughly $30 Billion in revenue, H&M is one of the largest fashion retailers in the world. Seeing the company stock drop 33% in 2017 is making the iconic company push forward on all fronts, evaluating new ways to conquer the prospective and uncertain world of fashion merchandizing, while researching ways to change retail in general. H&M strategies include an intensified push towards E-commerce, the closing of regular stores, while at the same time opening outlet-stores to move excess inventory, as well as more openings of specialty stores such as H&M Studio, Nyden and Arket, which follow recent concepts; H&M Home, COS, and & Other Stories. I live just minutes away from one of the companies more interesting tests, which opened its doors about two months ago. H&M’s test-store sits inside a neighborhood mall at Karlaplan and features a handful of new ways of operating, some of which are prominent and can be experienced within the store, while other developments are based on data-gathering and the use of new technology. Online Data decides the store offer: By compiling data of online purchases as well as search-patterns for the local market, i.e. the online consumer behavior in the immediate area of the store, H&M has chosen items they know fit the demographic of the surrounding area. There are also fewer items in this store and it is less crammed with merchandise, which in it self makes for a premium, more luxurious feel. Green plants and light wood fixtures accentuate and add warmth to the otherwise minimalistic and clean in-store design. Even the classic red H&M logo has been made white to better fit the store profile and possibly the taste of the clientele in this rather upscale neighborhood. FOTOGRAFISKA is featured both on the walls and on display. Tickets to the gallery are included when you buy the book. 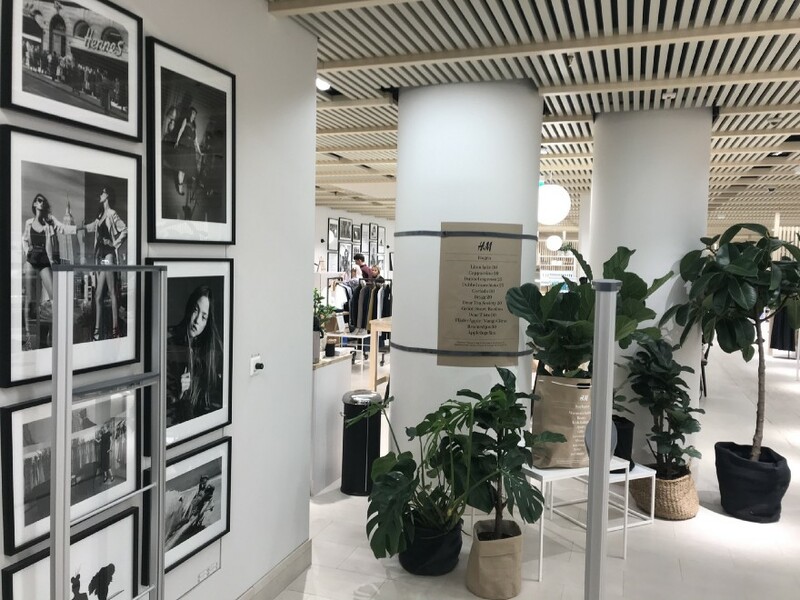 Creating a local feel to a global brand: As a global company it can be difficult to create a small or charming feel to a store, but in this one H&M has definitely found ways to do just that. As you walk in, you see a small café right by the entrance where people can sit and socialize (or drop off an uninterested husband). 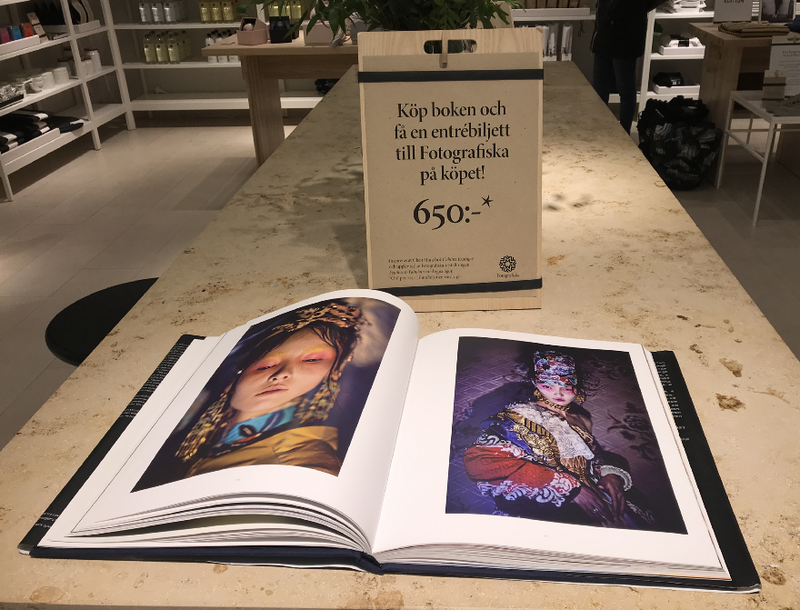 The walls display art from the local galleryFotografiska and H&M has made other neighborhood collaborations evident by giving their counterparts full credit at each offer, being it coffee, fresh flowers, or yoga-mats. By naming these partners H&M feels more locally oriented, giving shoppers ways to support neighborhood businesses even though they are obviously making the purchase from the giant. The STEAMERY is one of several local partners who get an introduction within the store. Technological advancements: The tagging system of each store-item is an example of new technology. Apparently the system is not up just yet, but every tag on a piece of clothing, plate or candle is going to be unique, allowing store manager to identify in real-time the exactly number of items in stock of each size and color. I’ve been told they can even scan items in bulk, as opposed to scanning individual tags, which would make for huge advantages in keeping stock up to date, perhaps even having the system order more on its own.. In the future this feature should also allow shoppers to identify if an item is sold out at a particular store, where it is available, as well as suggest viable alternatives or items to mix and match. The technology is called RFID (Radio-Frequency Identification) and has been around for use for different passes, pay-system and booking systems for years, in an array of technological variations. Is this enough? In 2018, the retail industry will continue to shift towards online and in particular to mobile. We see brands committing to delivering more of an experience in the offline environment and being less pushy in regards to making a sale in their flagship stores. Omnichannel and smart cohesiveness between sales points, delivery on demand etc, are other examples of areas where retail will develop further. 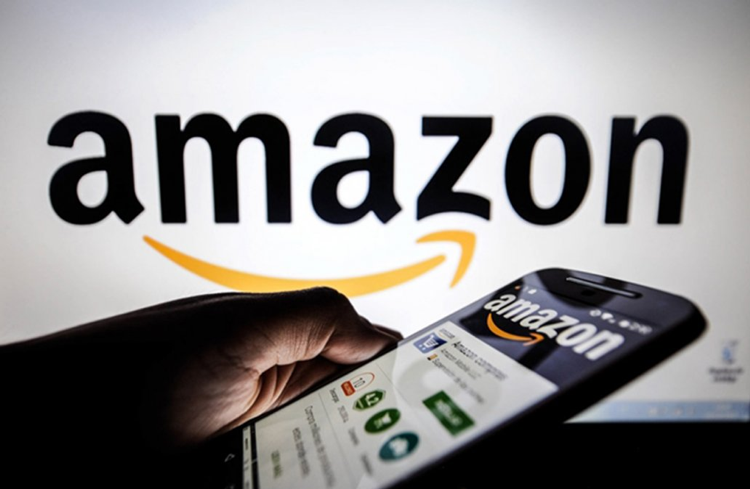 We see many brands falling behind the innovators in regards to infrastructure and logistics, and a big question remain as to how emerging companies connected to Amazon’s dominating business model will affect big retailers like H&M. Art and green plants throughout the store. Possible consequences: In Swedish fashion in general, and in upmarket areas like Östermalm you see clearly how people follow trends from season to season. Swedes are highly influenced by what is hot at the moment and if large chains such as H&M start to develop more localized offers this trend might become increasingly evident, giving us even more homogeneous fashion, or interior design, for example. Buyers in these stores already follow trends of course, but having the data-analytics team of big corporations further narrow our choices would surely make us dress more alike. As a reaction to this, small boutiques and stores with very unique fashion should be able thrive and act as a counterpart, as not everyone wants to dress like their next-door neighbour. The coming year: 2018 will be an important year for retailers. Big and small. The challenges are many in terms of both balancing the online & off-line approach, as well as managing strategies for best service and distribution. 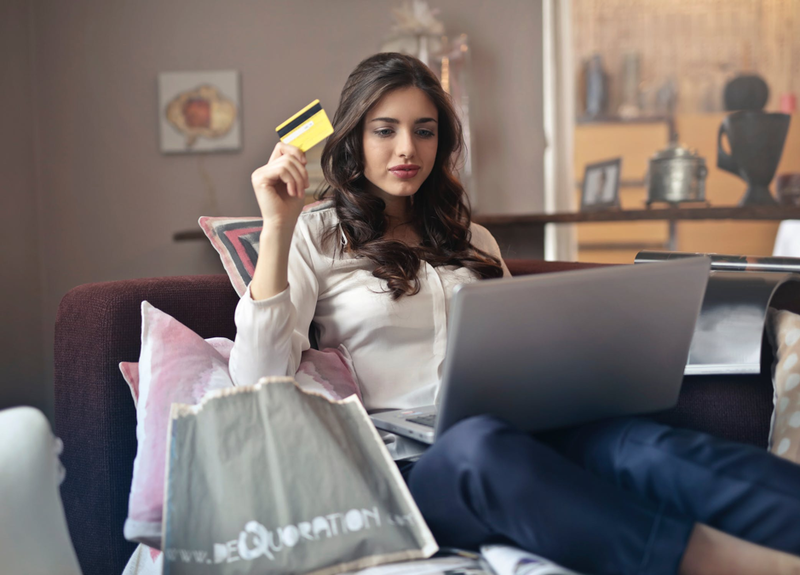 But, I also see tremendous opportunity for retailers to strengthen their brand and connection to customers by finding their own ‘perfect match’ between convenience and personalized service. Finding that niche way to deliver the goods or personalizing the interaction of a purchase can make a company stand out to key consumers, just as much as the product it self. At Visual ID we are currently developing future retail environments for a big Swedish retailer and I look forward to sharing this progress at another time. As I am getting ready to ship another brand-deck we’ve made at Visual ID the last months I feel compelled to share a few ways to work on building your brand. It’s the recent discussions with companies’ founders and managers that led me to want to share these 5 points. We have workshopped, researched and collaborated our way to final logotypes & other core brand elements. The topics of conversations has varied greatly depending on the company and industry, but they were all central issues to each founder. From gender-questions, to the value of brand-history, to finding ways to measure the effort of a re-branding, it&apos;s been rewarding discussions. Working with brand-questions allow you to get to the core of why a company exists, and through that conversation you get to know the people behind the company -and ultimately what drives them. It&apos;s fascinating to understand what motivates people, and a great way to get to know someone. Before I get into the 5 ways to look at your brand, here are some reasons to do the work and some upsides of of getting it right. Successful brands use both art & science to connect and create a strong name: They follow scientific evidence (consumer data), and -they connect using the art of storytelling (video, images and narrative). Knowledge of brand strategy will help you attract customers and make use of learned consumer behaviors. By analyzing customer journeys and understanding where your brand plays a role in a decision-making process, it is possible to assess content and figure out which messages can make an impact and in turn inspire action. This understanding translates into sales, and no brand can get enough of that. In the long term a well-developed brand helps an organization focus. It brings meaning both to co-workers and customers. A healthy brand also develops with age, growing new characteristics as it matures. The process of re-examining both your brand and your target consumers help your brand thrive today, and tomorrow. Find some ways below to check if your brand is solid as an oak, or hollow as a drum. If you don’t know whom your brand is for, or don’t know how they will consume your offer, you have serious work to do. Even if your brand has a very wide audience its vital to define the person who would like it the most, your ideal customer. It will help you direct your efforts and sharpen your communications, creating strong advocates and fans of your company. There are several techniques to help define your target audience, more on that another time. The reason &apos;why&apos; a company does what it does, whether harvesting corn or creating AI, often matters when establishing connections with customers. Let your audience know why you exist and what drives you. The &apos;why&apos; also help you align internally and give meaning throughout an organization. If you operate in a field with many competitors, tell the story of &apos;why&apos; convincingly. We all respond to excitement and many times it’s the passion for your work that gets customers interested. Unless you are Elon Musk and create entirely new marketplaces, like racing to inhabit Mars, you will probably have competitors in your space. To be successful you need to stand out in that crowd and do so in ways that matters to your audience. There are as many ways to stand out, as there are personalities, and countless ways to communicate that edge. But finding your uniqueness, and communicating it well, is half the battle to a good position. My personal favorite in terms of differentiating is Apple Computers. Your might wonder why, being that they are one of the largest corporations on the planet, but that wasn&apos;t always the case of course. Even the biggest have once been small. As a kid I was interested in computers and I remember how very different the apple computer looked, and how different they “sounded”. I had no idea that it had anything to do with branding or marketing of course, I just remember how I took notice. In 1990, Apple had about 8% of the personal computer market share, while Microsoft had their software in all the rest of the worlds PC’s. IBM was another huge company, but it was Microsoft you saw, used and experienced, although not always the most positive way as you banged away at the plastic keys, hoping for a faster and better response from the puke-grey box in front of you. Back then we, people, were smarter than computers in most ways, or at least it definitely felt like we were. Apple turned the world of PC&apos;s on its head, not by making a vastly superior product, at least not for some time. But because of how they portrayed themselves with their particular style and tone, which trickled down directly from Mr. Steve Job’s persona. Later, their closed-system products came to change how we listened to music, talked on the phone and used the Internet. I guess the question today is, will they be able to keep differentiating? Its ok to take chances. Hell, you might never have a successful company if you don’t. But if you find yourself with a business that has managed to gain some popularity, try not to wager that reputation by disappointing your main customer. Instead, stay consistent and keep giving them more of what already worked, while trying new ways to grow and perhaps widen your audience in the meantime. Nobody likes when those we care about say one thing and do another, the same goes for brands. There is no easy way to be compete today. But if you believe in your business, your team and your plan then push forward and don’t look back. When you find your edge use it, and keep expanding on your advantage. Double down on your strength and keep improving. In Facebook’s handbook to new employees they say: “If we don’t create the thing that kills Facebook, someone else will.” That’s pretty spot on. The world will keep evolving whether we like it or not and your business is a constant wheel of Planning – Executing – Measuring – Evaluating – Adopting – and hopefully Innovating. Finally, just remember that branding is about building connections with your consumers. This comes natural to some, while others really need to strategize to have a chance at creating and keeping meaningful bonds. Its not easy, but the good news is that it can be done in more ways than anyone can list in an article. Find your own way. A style that fits you and your organization. Your unique way to connect will add personality to your organization and that in itself is a very good starting point.